There are currently several farmer’s markets in Clark County – check them out this summer! Customers love selecting their own locally grown fresh produce. 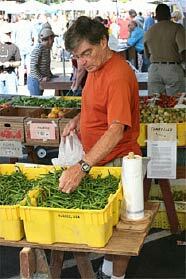 Check the WSU FarmFinder for a more complete listing of Farmers’ Markets in Washington and Oregon. 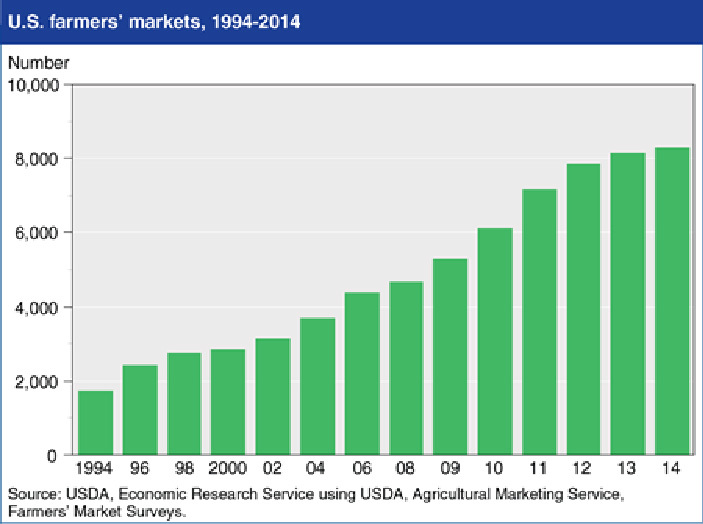 presently 3,706 Farmer’s markets in America, up 70% from 1,755 just 10 years ago. Farmers markets, now an integral part in the urban/farm linkage, have continued to rise in popularity, mostly due to the growing consumer interest in obtaining fresh products directly from the farm. Shoppers love to be able to meet the farmer who raised their food, which they know will be sold to them fresh and in-season. Locally raised food is often from a distance of only 2–3 hours away or less. Shoppers that express an interest in supporting agricultural land preservation are keenly aware of locally produced food. It is not uncommon for the average supermarket item to have traveled over 1,200 miles to the kitchen, and may have changed hands as many as 6 times. Growth in the number of Farmer’s Markets across the U.S. according to the Vancouver Farmers Market is a very popular addition to downtown Vancouver. It attracts vendors from eastern Washington as well as the Willamette Valley. For many food crops farmers may only receive a 20% margin: for every item sold at a super-market the farmer only receives on average 20% of the shopper’s dollar. When food is sold directly however, the return is 100% as the food item only changes hands once: from the farmer into the arms or hands of the shopper. Thus by charging retail prices the net return on investment, which includes both time and labor, is considerably better. In fact most shoppers realize that they are paying nearly the same price as they would be at a conventional super-market. Many customers will readily admit that the “fun factor” of buying directly from the farmer is enough for them to shun the super-market on a more frequent basis when a particular food item is in seasonally. The City of Vancouver is very proud of their creation of an indoor, year-round farmers market. 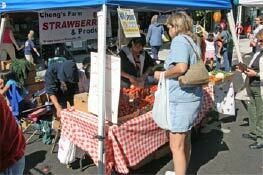 There are many other farmers markets all across Washington. 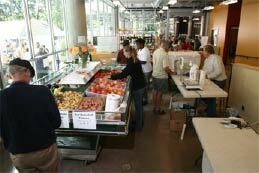 The Washington State Farmers Market Association, based in Seattle, WA maintains a list of all the markets. This association holds an annual convention that caters to the needs of both existing as well as prospective market managers. There are now three different farmers markets in the City of Portland that often attract shoppers from Clark county. The Saturday Market is held in the South Parks Block at Portland State University (SW Park between Harrison and Montgomery) on Saturdays from 8:30 – 2 pm. The Wednesday market is held in the South Parks blocks at Shemanski Park. The Thursday Market is held in the Ecotrust parking lot (NW 10th between Irving and Johnson). For further information on all these activities contact the Portland Farmers Market or call 503/ 241-0032. There exists an excellent reference book written by a local author (Vance Corum, formerly with WSU) on the whole subject of how to display wares at farmers markets, as well as how to set up and manage new operations. The book is titled: The New Farmers Market and is available from New World Publishing in Auburn California. This 296-page book currently serves the role of being the best source of practical information on the subject.